When I drop Emily at work on Saturday or Sunday, I drive up the hill and drop her at the barn, ready to work. At night I wait for her in the "Employee Parking Only" field at the bottom of the hill. At night a constant stream of cars goes up the hill and comes down with trees on top. But last weekend Aunt Beth and Uncle Bill went for a tree. 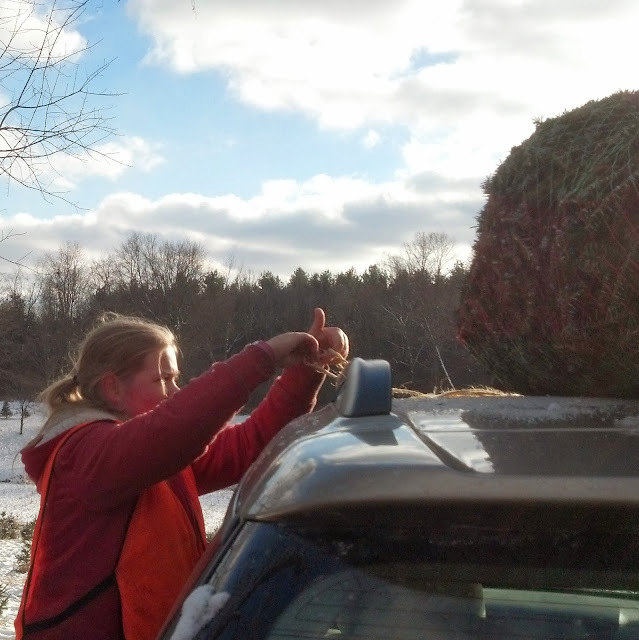 I got right on board for a first hand view of what it takes to man a Christmas tree lot. Or child labor it, as the case may be. Heritage Farms has jobs for any teen who wants to work. Cut your own. "We give them a sled and a saw and tell them what field to use. If they come back with a tree we didn't tag in the fall, it's a two hundred dollar tree." OK, then, there are rules! And a lot of fun, too. Trees everywhere! By the barn. On the front lawn, lashed to stakes that held the corn maze only six weeks ago. The "shaker". It shakes the snow and loose needles from the tree by vibrating it mightily. The "baler". The trunk of the tree goes in the large end and comes out the front, the tree wrapped tightly in mesh. I watched the boys reach in and grab one or two fist fulls of branches (technique) to bring the tree through. This way, Uncle Bill. The Fraziers are right over here. The tree is selected, shaken, baled, a receipt written. 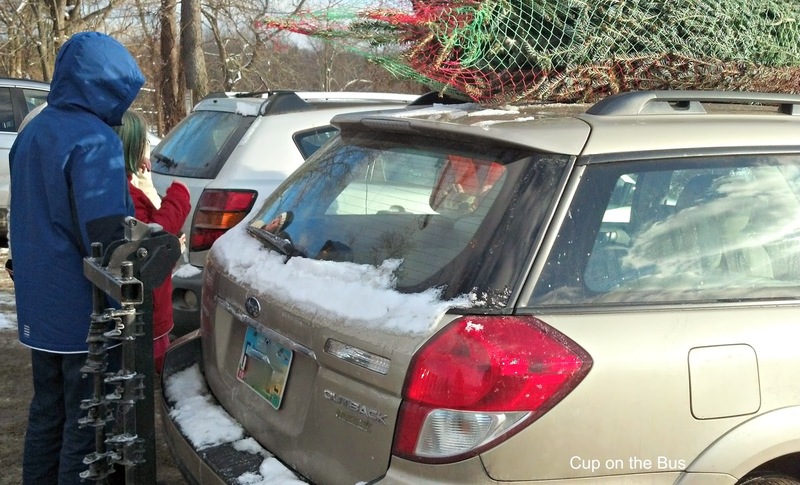 To the total amazement of one (at least) cousin, Emily shoulders the tree, takes it to the car. Up, up and away, she hoisted it to the roof. And commenced tying it down from the roll of twine in her back pocket. She has her very own pocket knife, too. This was a favorite picture and I thought I lost it! Caroline and Francis (behind Emily) studying technique. Emily has just made a knot she can use to pull the twine through and get good tension against the tree. Francis demands the knot's name. "I don't know. I learned it. I do it. Next customer, please." Christmas trees have SUCH an evocative smell. And I love Emily's capability. And attitude. You done good. Very good. She's a hard working little girl....those trees are not light weights. I am thinking those grandkids are making you proud. Good Job. We have a fake one but I remember the smell of the real ones from my childhood nothing beats it, they once sold them in little fruit shops all around Sydney I haven't seen them for years. Emily works so hard - she's a star. Cutting your own tree is so much fun, even if toes get chilly. And good for Emily. Every girl needs her own pocket knife. Emily should be so proud of her new skills. I'm quite jealous of the pocket knife...but know I'd never earn one as Emily has done. That is good hard work not to mention cold, well done Emily. Good for Emily. She looks very competent. Go Emily! I think at least one of my grandgirls would love that opportunity, and the grandboy too. Too bad they live in the city. I hope the farm there lets the trees be trees. The ones many lots sell here are pruned to a perfect cone shape...so unnatural looking. I hate them. Trees should be unbalanced, have holes, be lopsided. I like Emily. A girl and her pocketknife is a beautiful thing. Himself got me my own pocketknife for an anniversary gift one year. He told me i'd find reason to use it nearly every day. He was right. His mother was horrified that he got me that for an anniversary gift and more horrfied still to see me wax rhapsodic about it. I am impressed! Those trees aren't light, especially by the end of the day. Great photos! Good for Emily! She looked like a pro out there maneuvering that tree! I like a place that will hire teens who want to work. The job market here can be so tight the teens are often overlooked. I never have cut down a Christmas tree like this; sounds like quite an adventure! I had no idea about the shaking and baling part of the process, that is never shown in the movies I've seen. I'm impressed with Emily shouldering a tree on her own! Despite the cold, I bet Emily is having a great time. What a fun post! I enjoyed looking at all the pictures. It has been years since we bought a real tree and I especially miss the pine scent. However, an artificial tree is less of a hassle for us. Lol. What a great job for a teen! Wish there was a heritage farm around here for my grandson. He'll be 15 and looking for a job next summer and some jobs available in the city worry me. Love your pictures and congrats to Emily for doing such a good job! Joanne - what a hive of industry! We have an artificial tree (because one of our dogs used to get pine needles in his paws so we abandoned real ones!) but I do remember the excitement of hubby and I taking the kids to chose a tree - then came the fun of getting it in the house and potting it up (trying to get it straight!). ....and I wondered why I hadn't seen your blog recently - it appears to have dropped off my blog list! (I didn't touch it, honest!) You're now re-instated on both my blogs and you'll probably give a wry smile to see I've posted about patchwork quilts over at The Knitting Assassin! - I'm succumbing to patchitits.....! What a lovely young lady Emily is. i have a very special knot from the sailing days and don't remember the name of it..Good for Emily-maybe it should be called an "emily" Keep on keeping on..Love ya. I wish all young people could be as strong and efficient as Emily. How wonderful that she has such excellent work ethic. It will serve her well in the future. She's also a beautiful young girl. That's quite a job for anyone, much less a teenage girl. Good for Emily. Hope she's making good money during the holiday season.